TypographyA Very Short Introduction: Are they by any chance related? 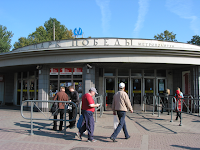 I couldn’t help noticing the resemblance between Park Pobedy Metropolitan station in St Petersburg and Southgate Underground station. I wonder if they are by any chance related? Southgate station photograph by Mark Moxon. All rights reserved.